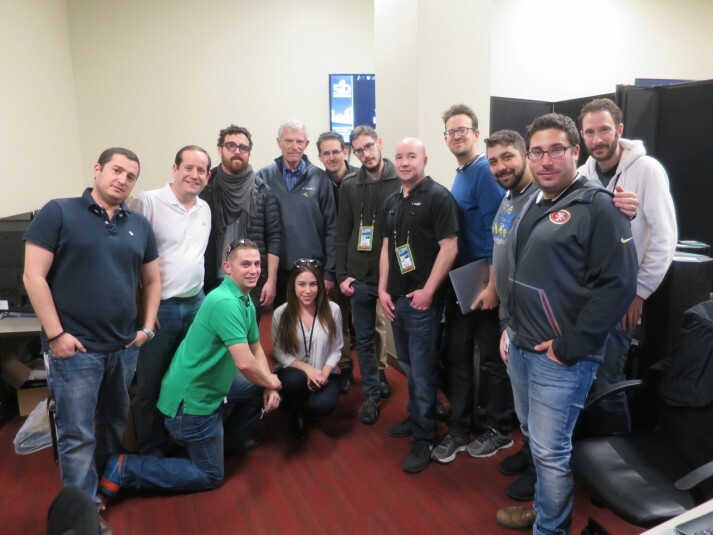 Aviv Shapiro, COO of FreeD; his team; and CBS Sports’ Ken Mack, producer, and Ken Aagaard, EVP, engineering, operations, and production services, provided an in-depth overview of the EyeVision 360 system, which will, hopefully, be a big part of Super Bowl 50. The FreeD team and the CBS Sports team will be putting EyeVision 360 to the test tomorrow for Super Bowl 50. The FreeD EyeVision 360 system comprises 36 5K cameras installed around the stadium. Those 36 cameras are split into two groups of 18, each group having one of the two 25-yard lines as its central focus point. The FreeD production team can select a point in time within a video recording across all of those cameras, pause it, render images from all the cameras together, and then create a 360 environment in which the operator can circle the play from all angles. The system also will introduce a feature whereby a graphic vertical blue pane can be placed across a place on the field. If a player or ball crosses that pane (for example, at the goal line or on a crucial fourth-down plunge play), the portion of the player or ball that crosses the pane will be visible through the virtual wall. A test of the EyeVision 360 system illustrates its potential for showing whether a player broke the plane of the goal line. Left is a Skycam shot of three people relative to the goal line, and, on the right, one can see which of them broke the plane and by how much. The production team will be located on the press level along with Mack, who will be responsible for finding the plays that will benefit most from the ability to freeze the action and look at the play from all angles. Shapira adds that a second-generation system will soon be available and is expected to be installed within venues soon. The system also has potential applications within VR applications. FreeD is working with Microsoft, Sony, and Intel on using the system to improve the VR experience for consumer devices and laptops. But, for now, all the energy and attention of FreeD is on its big debut at Super Bowl 50 tomorrow. Stay tuned to a TV set near you to see how CBS Sports integrates it into the broadcast.